How could we almost have forgotten Mardi Gras? It’s less than a week away! Mardi Gras, or Fat Tuesday, arose from the tradition of eating fatty foods the day before the start of the Lenten fasting prior to Easter. Growing up, my mom made doughnuts from scratch every year on Fat Tuesday. We would wake up early in the morning to the smell of deep fried dough. Nothing else like it, but these colorful Mardi Gras cupcakes come close! These cupcakes have Madagascar vanilla beans, buttermilk and some added sour cream for flavor. There is nothing basic about the flavor of these bad boys! 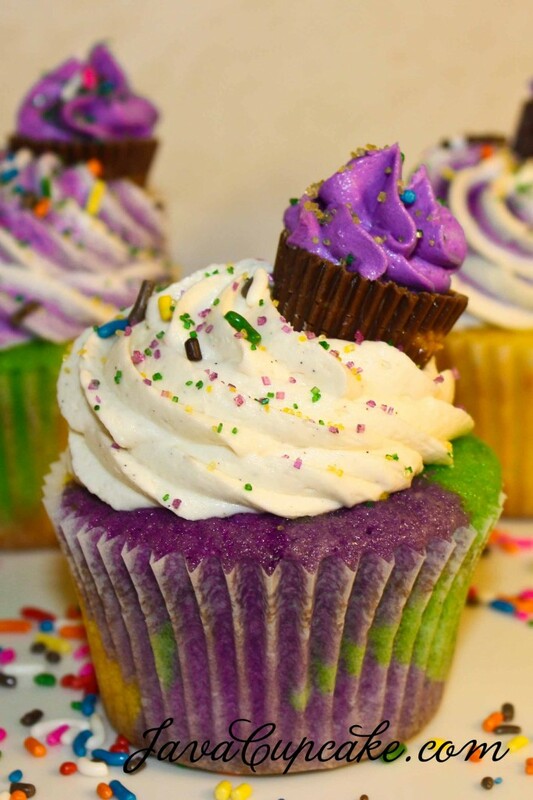 We found these on javacupcake and think these colorful cupcakes certainly say Mardi Gras! Add all the flour at once and mix on low to medium speed until smooth. Don’t over mix!! Add another smaller scoop of each color until the liners are 1/2-2/3 full. NOTE: Do not fill these more than 2/3 full. They puff up nicely and you don’t want overflow! 1/4lb at a time, add the powdered sugar. After the first addition, add the vanilla extract and cinnamon. Beat until smooth. Place a peanut butter cup on top of each cupcake, off center.